Chris is a Sports Science graduate who went on to train as a physiotherapist in Bath in 1993. 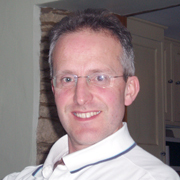 After graduating with his degree in Physiotherapy in 1996 he has worked locally in the NHS at The Royal United Hospital in Bath, as well as hospitals in Chippenham, Bradford on Avon, Melksham and Devizes. This has enabled him to develop very good links with local Orthopaedic Consultants and GPs. Chris is therefore well placed to advise and treat Orthopaedic conditions and will ensure you receive the highest quality treatment and advice to facilitate a speedy recovery. He believes in treating the cause of the problem to help prevent further issues from occurring. Chris maintains regular continuing professional development through relevant courses and membership of The Health and Care Professions Council (HCPC), PhysioFirst and the Acupuncture Association of Chartered Physiotherapists (AACP). Post graduate training includes Acupuncture and a Diploma in Injection Therapy from the University of Nottingham. Understanding your condition through accurate assessment and diagnosis enables you to help yourself with the treatment process and prevent further re-occurrences. The body is very good at healing itself and occasionally just needs pushing in the right direction. Daily stresses and strains due to bad posture and work can develop into serious problems but these can be rectified with the appropriate guidance.